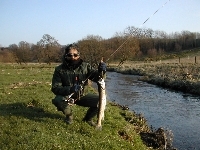 There are many lakes and rivers where you can fish in Latvia. There are also many small lakes and ponds in Latvia that are privately owned. Here you can only go fishing with the owner’s permission. This is a chargeable. To fish in the Latvian rivers and lakes, you need a permit. This is available in stores that also sell fishing equipment and rent fishing equipment. In the larger Latvian lakes, including Usma lake north of Kuldiga you can also rent boats to go fishing. When you are in possession of all equipment, fishing in Latvia is awesome! Carp, pike, perch, salmon, trout, tench and bream are the most common freshwater fish in Latvia. In winter, many Latvians go ice fishing. Ice fishing is very popular with the local Latvian population and an experience you shouldn’t miss. So come fishing in Latvia! Ice fishing is a sport which most Latvians in Latvia practice throughout the winter. 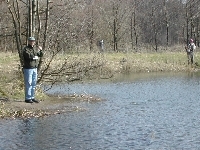 Fly fishing is also a very common activity in Latvia. The Tourist Office in Kuldiga (where our cottages are) you can get more information about fly fishing. 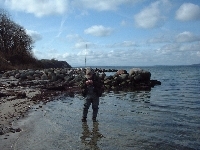 They can also provide a guide who can lead you to the best fishing spots of Latvia. Of course he can also teach everything there is to know about fly fishing! Fly fishing is a unique experience! Fishing in Latvia: an amazing experience that you will not want to miss. When you love to go fishing you will experience the most amazing holiday in Latvia! Book one of our holiday houses in Latvia and come fishing in Latvia!